This morning we were off bright and early for our flight to Lukla. The taxi ride to the airport was the usual dodgem cars. Pauline seems to have gotten used to the taxis going the wrong way up the road into oncoming traffic😋. We ended up on the tarmac with a bunch of Israelis who all had overweight packs. The ground crew were not happy. They wanted to send some bags on the next flight. After 15min of indecision (arguing) they loaded us all and the baggage. Pauline was not happy😣. The pilot said it was all OK, so off we flew. As we came in to land we could see the runway perched on the side of a ridge. It was uphill and looked very short. After we landed and everyone stopped the usual clapping and cheering the pilot proudly told us it is the shortest runway in the world! After the excitement of the flight the trek was straightforward. Lots of other trekkers going the same way, bit like walking in a procession. After our boot camp with Kim in Mustang the other trekkers were way too slow. Pauline was off, I lost track of how many we passed😀. We made it as far as Monjo before we stopped for the night. 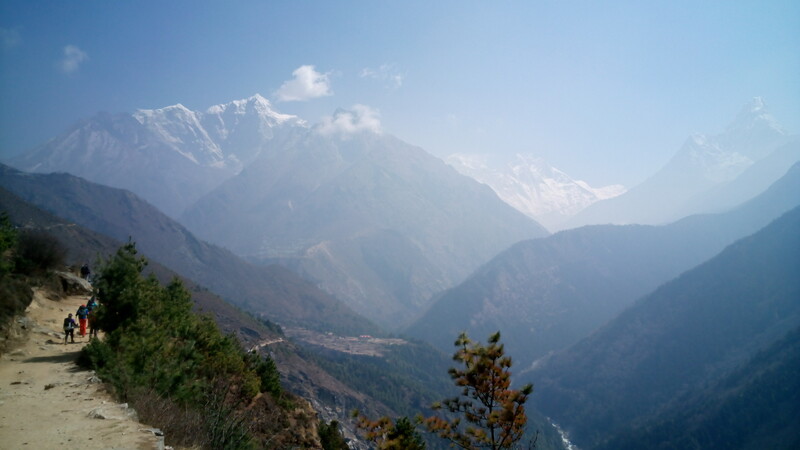 Long climb to Namche. Lots of trekkers, the chart at the park entrance had over 5000 visitors for Mar this year. I think Pauline has overcome her fear of suspension bridges. There are lots of them on the way to Namche. 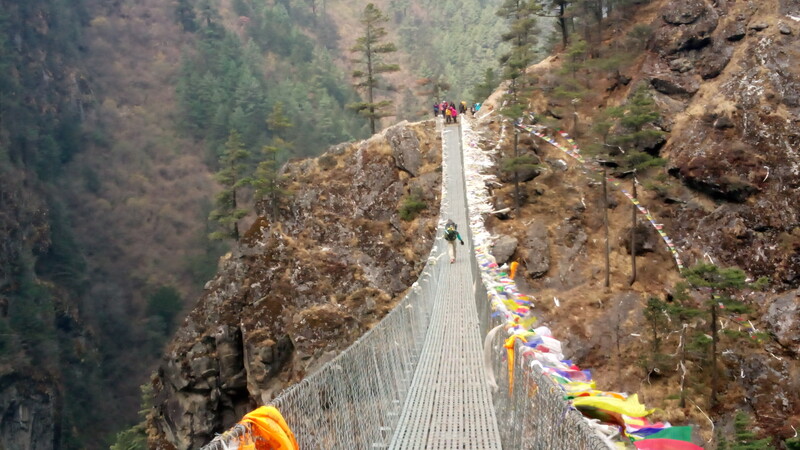 She crossed the last bridge before the 600m climb to Namche without a problem. It is one of the longest and certainly the highest we have crossed 😅. Clear skies this morning so we got a look at the peaks surrounding Namche. Awesome! We stayed at Moon light lodge last night. Great food and good hosts, but very noisy, lots of trekkers plodding around in huge boots. They must think they are actually climbing Everest and not just going to base camp! We joined the procession of trekkers heading to base camp. Hundreds of them in all shapes and sizes. I’m glad we are not doing base camp and will leave them all behind tomorrow. 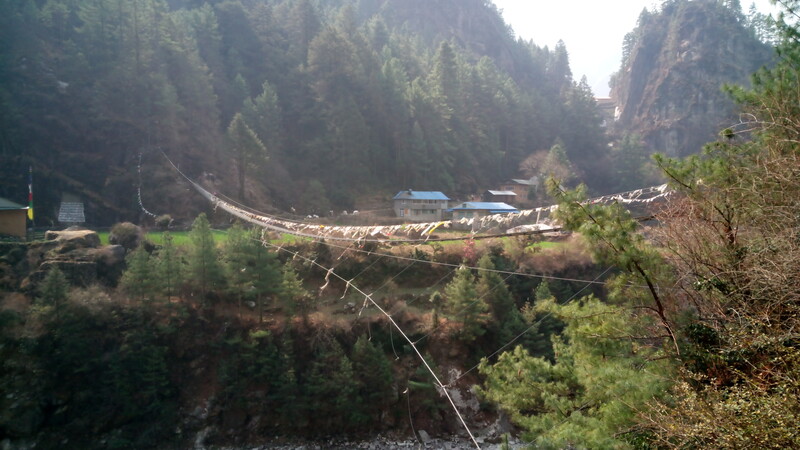 After a few hours and a couple of suspension bridges we reached Pengboche. It was a bigger climb than I anticipated so we are both tired. The weather has closed in this afternoon, it is beginning to snow. The forecast is for it to clear by morning with no cloud, fingers crossed 😨. We also got our first views of Everest this morning. Only the very top as it is still behind some other mountains😁. We woke to about 5cm of snow this morning. It had stopped by the time we finished breakfast. So we had some views of the Himalayas before the clouds moved back in. It is forecast to snow again this afternoon. 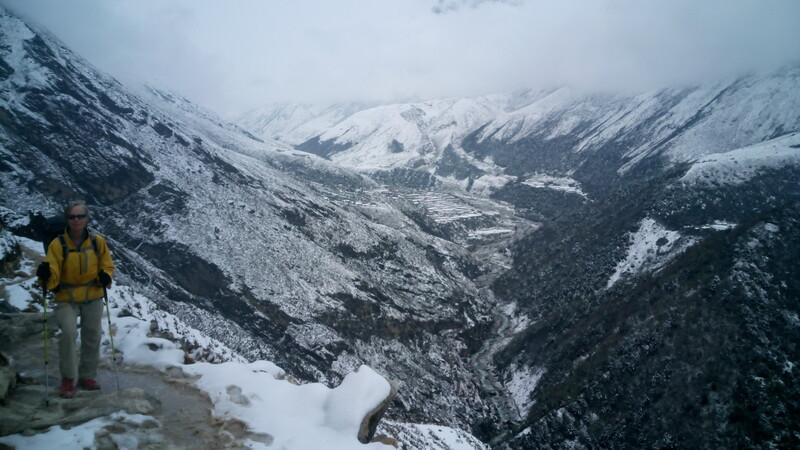 We managed to make it to Phortse just before it started to snow again. Pauline is now tucked away in her super sleeping bag warming up😴. The plan was to do the high route on the east side of the valley up from Phortse to Gokyo. We decided to change this as the route up the west side has more tea houses and is much easier to bail out if things get too hard for Pauline. This turned out to be a really good choice, we could see the east route was covered in ice and would have been quite dangerous. Yesterday’s snow storms have all cleared. They were a blessing in disguise. Today we have no dust😀 and crystal clear skies. The views as we climbed to Dole are just fantastic! Huge snow capped mountains on all sides. Some of the peaks are up over 6000m. Our new strategy with Pauline at high altitude seems to be working OK. I have taken all of the heavy stuff from her pack. We are also doing much more frequent stops and for longer. Much the same as the porters. We followed two of them up this morning, both were carrying five coffee tables each! We are also doing shorter days. Today we arrived in Dole at 12:30 and spent the afternoon lying around in the sun. I did some washing and aired a lot of our gear out. Very pleasant even if we are at 4050m. Tomorrow and the day after are supposedly flatter than today. The Nepalese have a very different concept of flat to us. So I’m hoping the climbs are not as steep. Tomorrow we will stop at Machermo 4400m and the day after at Gokyo 4760m. Almost forgot, our tea house in Phortse had deluxe rooms, each with their own bathroom with Western toilet. Ours didn’t flush and was mounted out of level but that’s ok, it’s Nepal😁. All was going well till Pauline went to the toilet before going to bed. I heard her yell out the toilet is broken. I assumed she meant it had no water and wouldn’t flush. How wrong was I. The entire pan had snapped off at the base. I’m not sure what aerobics she was doing! None actually, we think it was just cracked from expansion and contraction as they mortar the whole pan into the floor. Going to be very careful of Western toilets from now on! As we get higher and further from any road the price of food is increasing. It’s still cheap by our standards. For example last night at Dole our room was 100 rupee (au$1.20 – one dollar twenty cents) for the night. Three meals for both of us plus the room was 4500 rupee (au$58.00). The food is basic but well made. Usual trekking fare, pasta, rice, potatoes, lentils with a variety of toppings. The lodge make all their money on the food! If you eat at a different place to where you stay the room price escalates. 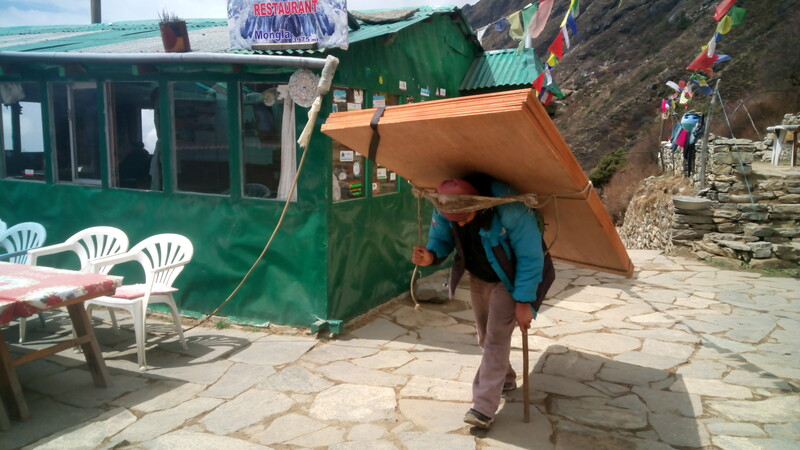 You also need to consider someone carried all the food and fuel in on their back from the nearest road, or it was flown in to Lukla in a Twin Otter plane. I think the nearest road is Jiri which is over 50km away and a lot of high passes. Even Lukla is 20km away and 1000m lower. Today’s trek was up for a bit and then contoured for a couple of km then up a bit more. All up about 400m climb for the day. The mountains are getting bigger the further we go north. We went to a talk on altitude sickness at the local first aid post in Machermo. It is run by volunteer doctors who are up here for the trekking season. Most of the porters are from lower down in Nepal and do not have the adaptation to the altitude that the Sherpas and Tibetans have so they suffer from altitude sickness as much as we do. We both had our O2 levels checked and made a donation. 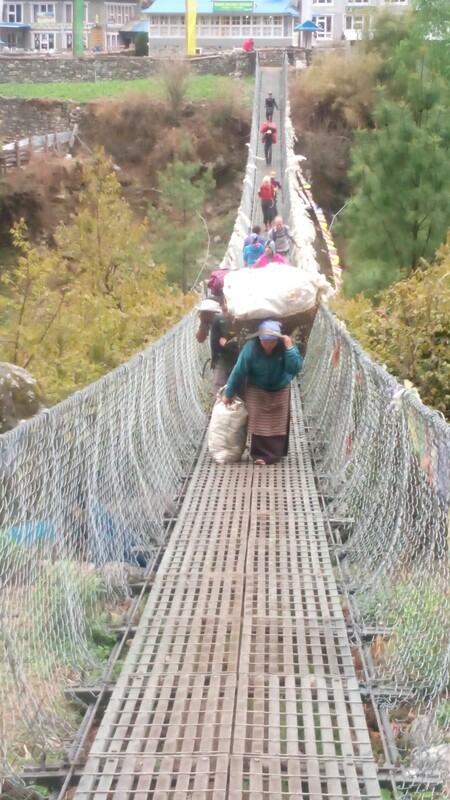 None of these treks would be possible without the constant stream of porters bringing up supplies! Finally arrived at Gokyo 4790m. We can see Cho Oyu 8188m to the north on the border with Tibet. 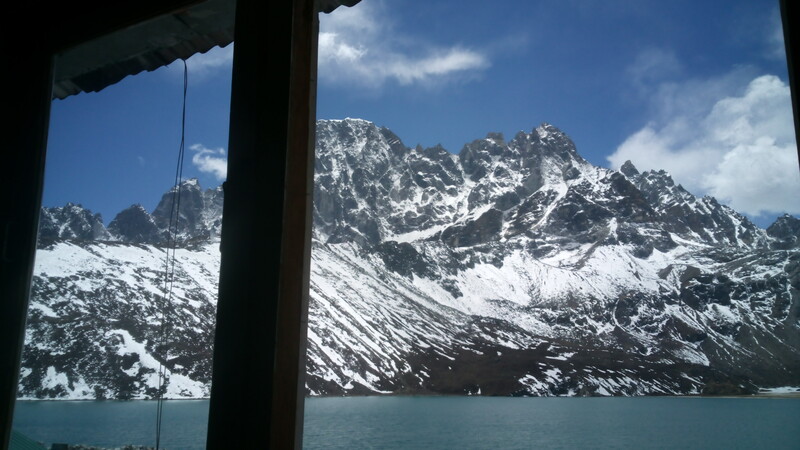 Our room overlooks the lake, Gokyo Tso, and towering above it is Pharilapche at 6017m. For the rest of today we are just lounging around enjoying the views. Tomorrow morning the weather forecast looks ok so we will do the stroll up to the top of Gokyo Ri at 5360m. It’s about one km and only takes two hours. Everyone is slooooow at this altitude! 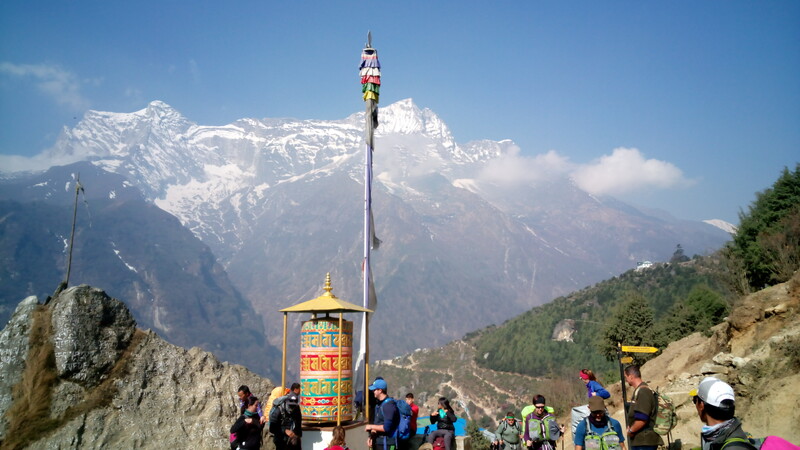 The views from there are panoramic and include most of the 8000m peaks in eastern Nepal – Everest, Cho Oyu, Lhotse, Makalu, Cholatse and Taboche. Every tea house we have stayed in has the promise of a hot shower. We would like to refute this claim. Hot showers in the Himalayas are about as real as Yak Wool blankets in Kathmandu, they just don’t exist. 😵 FYI all the Yak wool stuff is actually made from New Zealand merino! This morning we both summited Gokyo Ri 5360m. This is the small mountain to the north west of Gokyo. Summit is probably a bit of a stretch, it’s a strenuous walk to the top. The view is one of the best in the world. With Everest in the middle and lots of other 8000m peaks around it. Below is the remains of the Ngozumba glacier. This has receded right back to the base of Cho Oyo. So really is just the pile of rocks that used to be the glacier. Global warming in action! We hung around the summit for an hour or so till the cloud started to obscure the view. Then back down for lunch and to do some washing. It’s all down hill from here to Lukla. No more Diamox tablets for altitude sickness 😁. Udon noodle soup loaded with chili beef. 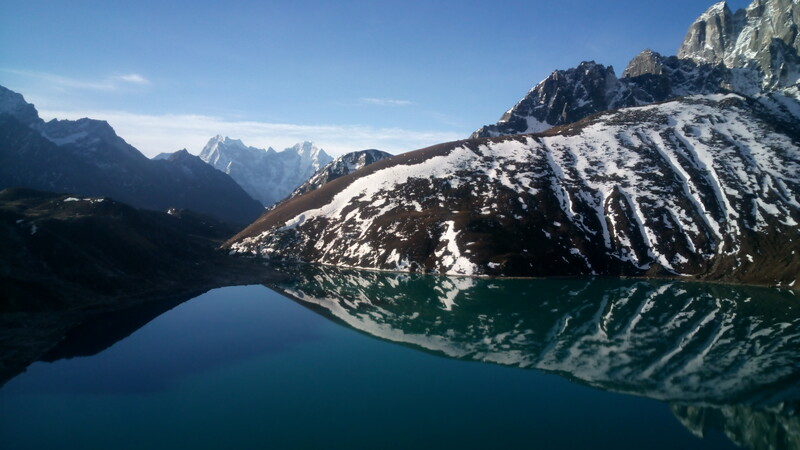 180 view from Gokyo Ri. Everest is in the middle. Downhill today, nearly the whole day! We did about 15km from Gokyo to Phortse Tenga. A drop in altitude of about 1300m. The weather has looked ominous for most of the day but no rain or snow so far😁. Lots of helicopters going up and down the valley. They did a medical evacuation from Gokyo this morning. The patient had really serious blisters and a problem with one leg, he couldn’t walk. We think most of the helicopter traffic is evacuations, it’s too overcast for anyone to pay for a scenic flight. It has taken us three days to get from Phortse Tenga to Lukla. Primarily because we found a tea house in Monjo that has real Hot Showers 😂 so we stayed and extra day. Two hot showers in 24hrs! The trek from Monjo to Lukla was five hours in the rain😨. 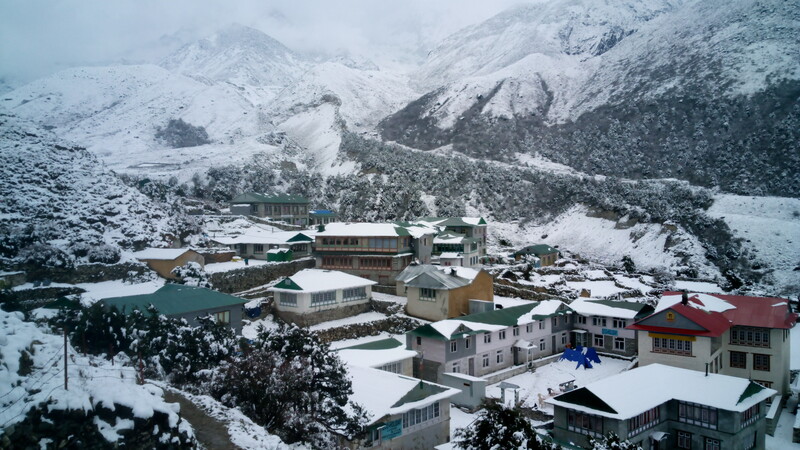 Lukla is in clouds today so no flights. Hopefully it will clear tomorrow. If they start flying again we will see if we can get on an earlier flight. Commercial porter with load of plywood. He will have carried this for over 20km on rocky tracks and gained about 1500m in altitude when we saw him! We awoke to the sound of helicopters and aeroplanes this morning. There is no low cloud! Last night there were 12 helicopters here. They are all flying this morning. A lot are taking passengers to Kathmandu as the helicopter flight is cheaper than missing an international flight. The first airplane from Kathmandu arrived just after sunrise. They can land, unload passengers and baggage, load up again with new passengers and luggage and be back in the air in under seven minutes. I lost track of how many flights there were. The weather has stopped all flights for a couple of days so there is a big backlog of passengers. After the initial rush we asked if we could get an earlier flight. We weren’t due to fly for a couple of days and the forecast does not look good. The guy said to come back with our bags and they would get us on. A quick dump of everything back into our packs and some fast talking later we had a boarding pass 😁. Not Pauline’s best flight, lots of turbulence. We are now back in Kathmandu filling in time till our flight back home. Pauline has already managed to have her dream come true – a hot shower, chicken Tandoori, chocolate brownie.